Have questions about anything on RealEstateMogul.com? We're here to help! Below you'll find answers to our most frequently asked questions. There's a good chance your question has already been answered. Just getting started? Click here to watch a tour of the entire site. If you still have questions or technical difficulties, you can always submit a support request at the bottom of the page. ► How does the Learn section work? ▼ How does the Learn section work? ► I’m REALLY just getting my feet wet with this real estate stuff. Where do I start? ▼ I’m REALLY just getting my feet wet with this real estate stuff. Where do I start? If you’re just getting started down real estate road, stop right now and download the No-BS Guide to Real Estate Investing. This is your 101 Guide to this business, and it will give you the foundation you need to make the most of your Mogul membership. ► How often are new lessons posted? ▼ How often are new lessons posted? Once a day, Monday through Friday. Lessons are provided by our expert faculty and curated by our Director of Awesome, JP Moses. ► How do I navigate the Learn module & find the lessons I want? ▼ How do I navigate the Learn module & find the lessons I want? We recognize the broad range of experience & interests among our members, so we built an educational platform that’s both deep and dynamic. Step-by-Step – if you want to learn the real estate wholesaling process step-by-step, for example, select “Step-by-Step” and we’ll reorder your lessons in the most logical step-by-step fashion we can. Just complete the lessons in order and follow the steps. Unlearned – lessons you have not yet marked as “Learned” will rise to the top; those you’ve already completed will fall to the bottom. Like arriving on a new college campus, the best way to learn your way around is simply to go for a walk. Play with the site … click everything … and before you know it, you’ll know the place like the back of your hand! ► How do I view .ppt or .pptx files from the Learn Power Pack Lesson Tools? ▼ How do I view .ppt or .pptx files from the Learn Power Pack Lesson Tools? We occasionally post PowerPoint slides as Power Pack Lesson Tools. If you're unable to view these files because you don't have the latest version of PowerPoint, no worries! For Mac users who do not have Apple iWork installed, simply download Open Office for Mac. ► How does the Interact section work? ▼ How does the Interact section work? ► How do use the Do Deals section to find a deal? ▼ How do use the Do Deals section to find a deal? ► How do I use the Do Deals section to find buyers? ▼ How do I use the Do Deals section to find buyers? ► How do I use the Do Deals section to find private money? ▼ How do I use the Do Deals section to find private money? Go to Do Deals > List a Property then select "I Need: Funding". Then just fill out all the info. This will post the listing as needing funding. Interested funding partners will respond if it seems to meet their criteria. Optional & Recommended: Select “Alert the Lender Network” which will send an email to the Mogul Lender Network (that is, everyone who specified themselves as willing to lend money – and their terms – when they created their profile). Alerting the lender network is free for Mogul Elite members. If someone is interested, they'll contact you via private message. ► What are the live training calls & when do they take place? ▼ What are the live training calls & when do they take place? ► What is the "Mogul Insider" email newsletter? ▼ What is the "Mogul Insider" email newsletter? ► How do Passive Cashflow Deals work? ▼ How do Passive Cashflow Deals work? Mogul Elite Members have access to premium passive cashflow deal opportunities. These opportunities are supplied by institutional investor-partners with whom we have long-standing relationships. We’ve negotiated with each of these firms for the right to provide exclusive access to Mogul Elite members. The typical deal is a single-family rental generating between $250 and $800 per month in rent. These deals are presented to Mogul Elite Members via email as they’re made available to us. In each case, the property is presented fully rehabbed and rent-ready. Tenants are placed and managed for you. Financing can be arranged if you need it. When you receive a Premium Cashflow Deal via email, simply click the “Claim This Deal” button and complete the form to express your interest. You’ll receive a response directly from the institutional partner who supplied the deal, and they’ll provide your next steps. We’re constantly looking to improve both the quantity and quality of these opportunities for Mogul Elite Members by establishing and vetting new institutional partnerships. ► What is Leveraged Cashflow? ▼ What is Leveraged Cashflow? "Leveraged Cashflow" is the net monthly rent you can expect if you make use of the standard financing that our premium deal supplier provides. For comparison, "Cashflow" is the net monthly rent you can expect if you buy the house cash in full. ► What is the "Promote for Cash" Program? ▼ What is the "Promote for Cash" Program? ► How often do I get paid from Promote for Cash? ▼ How often do I get paid from Promote for Cash? Click the “Promote for Cash” banner on the right side of your dashboard to go to the Promote for Cash page. Here you’ll find sample Facebook posts, tweets, and emails to help you spread the word about RealEstateMogul.com. You’ll also see a link that’s unique to you and your Mogul account. When people click that link, our system automatically records that it was you who referred them. If they become a member, we'll split their membership fee with you 50/50! If you refer a member who pays us $97/month, we’ll send you a check for $48.50/month (every single month) for the duration of their membership! Payouts are by check the second month after the sale. For example, if you refer a member who enrolls in January, you’ll receive a check in March. ► Can you tell me more about the different membership levels? ▼ Can you tell me more about the different membership levels? ► How do I change my password? ▼ How do I change my password? 1) Click on the Profile Icon in the upper right hand corner. 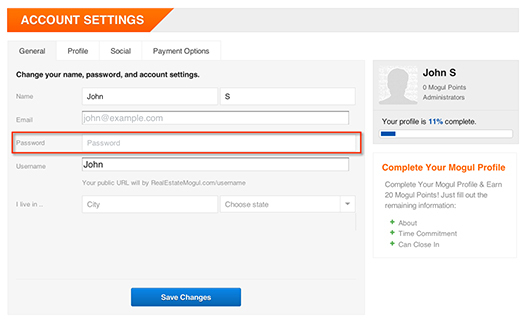 3) Under General Account Settings, enter your new password and click "Save Changes." ► How do I edit my account settings and profile? ▼ How do I edit my account settings and profile? 3) Navigate through the Account Settings tabs to edit your account. ► How do I send a private message? ▼ How do I send a private message? 1) Navigate your way to the profile of the user you wish to message. 2) Click on the "Message" button right under the users name. 3) Type in your Subject and message. Then click "Send Message." ► What are Mogul Points? ▼ What are Mogul Points? Mogul Points mean money, power, & respect. Members with the most Mogul Points will appear on the Top Moguls leaderboard. This is a great way to gain exposure for yourself and your business among the Mogul community. ► Where's my profile page? ▼ Where's my profile page? Your profile is located at http://realestatemogul.com/Username. Just replace “username” with your actual Mogul username, which you can find on the Account Settings page. 2) Select "View My Profile Page." ► I believe there was a billing error. What do I do? ▼ I believe there was a billing error. Please contact [email protected] and we'd be happy to assist you with this. ► How do I cancel my account? ▼ How do I cancel my account? 4) Click "Close My Account"
Don't see an answer to your question here? No problem!